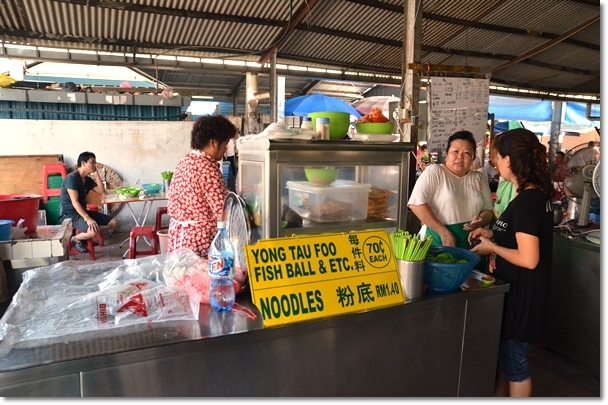 A breakfast fare that’s very common in Ipoh; fish ball noodles (yue dan fun, or liew fun) is actually an ensemble of plain noodles (served either with soup or dry/tossed with sauces) and a side serving of fish balls, various stuffed fish paste pieces and the very essential garlic chili sauce. It has become slightly more routine nowadays to eat out during breakfast compared to my growing years in Ipoh; when we would settle for a simpler breakfast of tea and breads. Maybe it’s thanks to this space of mine on the Web (gradually inching towards its 6 years now! 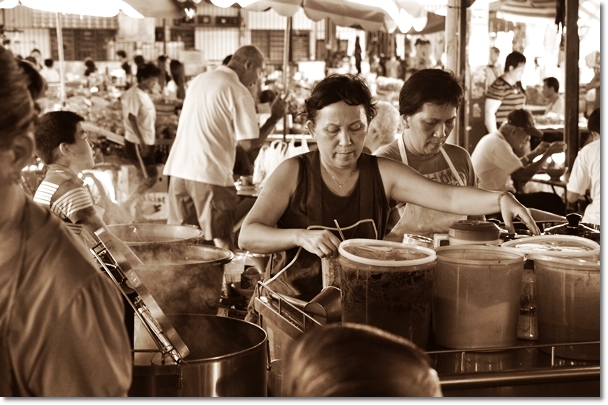 ), or the fact that Ipoh does offer an astounding array of quality hawker fares. It boils down to a matter of preference, but one of my favourite choice for breakfast? Fish ball noodles or ‘liew fun’. Simple, hearty and very comforting spread of noodles, yong tau foo and the chili sauce. Oh ya … let’s not forget the icing on the cake; a cup of white coffee. If legacy or experience is what you’re seeking for, then this nameless stall at Simee market would be right up your alley. That’s how long the Simee Market Yong Tau Foo and Fish Ball noodles stall had been thriving, though the entire tenure was not spent at this exact spot where it still stands; by the entrance of the market. The iconic ‘bountiful’ lady (let’s not be rude, but apparently everyone refers to her as “Fei Poh” Lee or Fat Lady Lee … dont’ quote me please!) still runs this stall; she’s the third generation of the Lee family. You don’t get a plethora of options here though; the conventional fish/pork balls, stuffed beancurd (yong tau foo) and deep fried ‘foo chook’ (beancurd sheets) tossed in a bowl of savoury soup flavoured with pepper and lightly garnished with a handful of chopped scallions. And the compulsory saucer plate of garlic chili sauce. Not forgetting the most customizable portion of them all; your noodles. Yellow noodles, rice vermicelli, kuey teow (flat rice noodles) or lou shu fun (silver needle noodles); either in soup or served dry; a balanced mix of soy sauce and dark soy sauce. The most enjoyable part of the breakfast was the chunky bites of fish/pork balls (an amalgam of fish and pork paste, shaped into irregular, delicious spheres), while my bowl of dry lou shu fun was rather bland. Anyway, if you’re not perched way up high on the heat tolerant scale, then I advise you to either come very early in the morning, or dress down slightly. Beads of sweat started forming on our foreheads while we were slurping on our noodles. The cup of hot coffee served by the stall next to the fish ball noodles stall was excellent. A surefire way to jumpstart the engine after a long working week. The passion on her face was evident, and there’s no doubt that she has a strong following of neighbourhood loyalists coming for their morning caffeine fix! The yong tau foo and fish balls were priced at RM0.70 each, while a bowl of noodle base cost RM1.40. Paying peanuts will net you monkeys? Nah … that rule does not apply here in Ipoh, thankfully. Other delightful bites from the market? The BEST egg tarts in Ipoh. 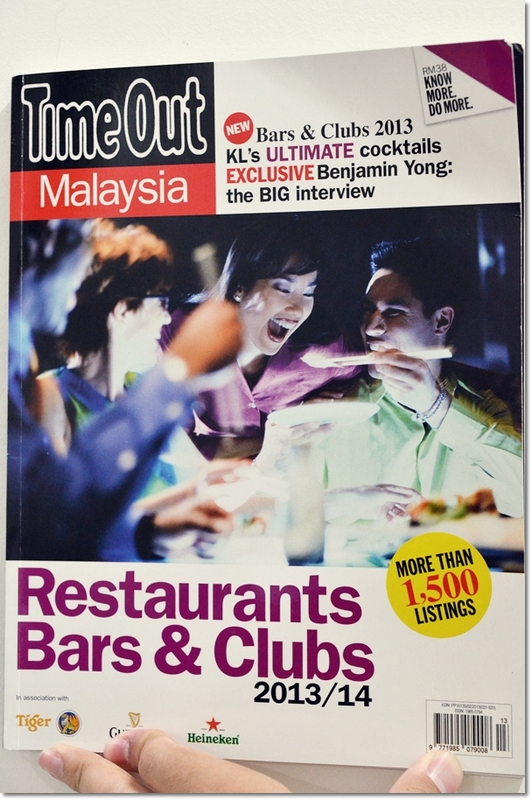 Have you read the Time Out Malaysia Restaurants, Bars & Clubs 2013/2014 Edition yet? 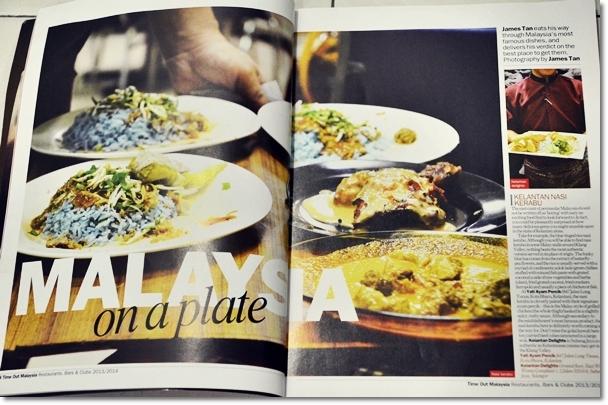 Motormouth’s article titled “Malaysia On A Plate” was published as feature story. Go grab a copy now! (For the more than 1,500 listings la … if you have had enough of my ramblings online). Happy Weekend folks! The soup is always piping hot. It’s like eating straight from a boiling pot of soup. I was @ d Simee Market Hawker stalls 3 years ago. I went for d Ipoh-styled curry noodles! I took a liking 2 Ipoh-styled curry noodles when I was a undergoing my training in Ipoh in d late 70s. 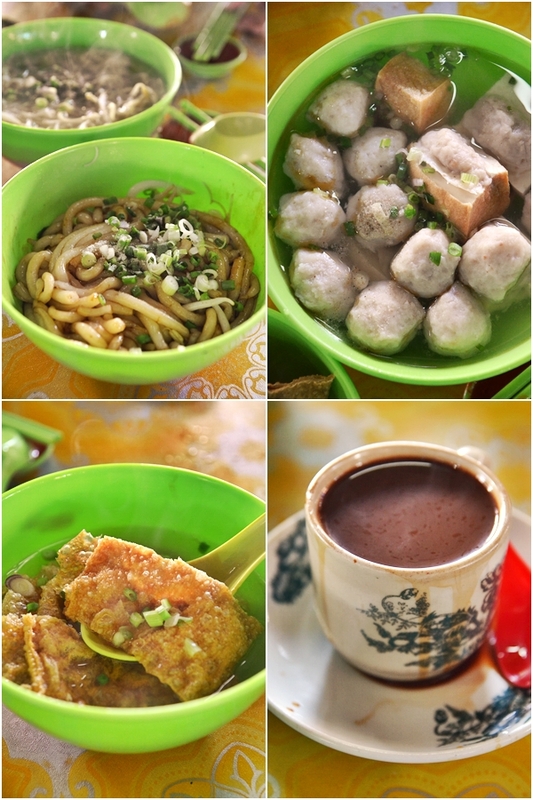 @ that time, I had my breakfast @ d hawker stalls that lined Jln Lau Pak Kuan in Ipoh Gardens!